Singapore: Streaming giant Netflix Inc. is looking at South and South-East Asia as a major destination to strengthen its play in the entertainment market, with 17 originals in various stages of production to be released over the next year. In India itself, the video-on-demand platform has five web series and one feature film scheduled soon for release. The web series comprises sports drama Selection Day co-produced by actor Anil Kapoor arriving in December; feminist drama Leila directed by Deepa Mehta, adaptations of books Midnight’s Children and Bard of Blood—the latter stars Emraan Hashmi and is co-produced by Shah Rukh Khan—and Baahubali:Before the Beginning, a spin-off of the iconic film franchise. A feature film called Rajma Chawal directed by Leena Yadav will also stream soon. 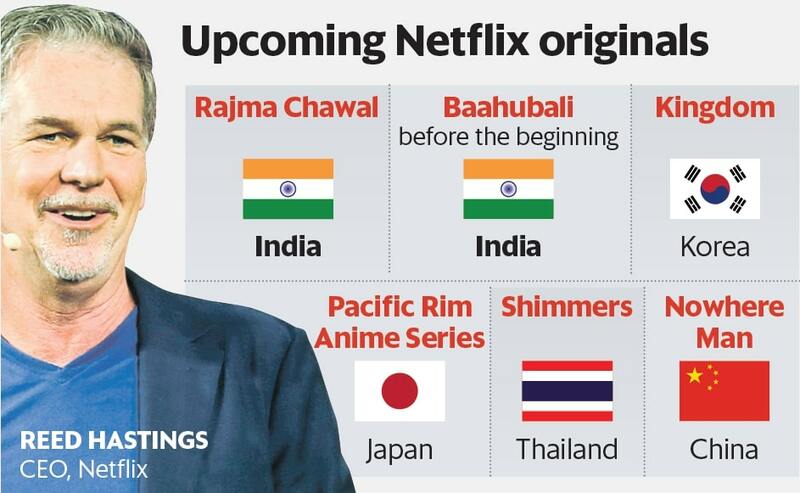 “Great stories can come from anywhere and right now, they are coming to us from Asia,” said Netflix chief content officer Ted Sarandos, citing the year’s first forays into India originals such as Sacred Games and Lust Stories. “We’re removing barriers of language and fixed schedule viewing to tell stories and Asia is a unique piece of that storytelling,” Sarandos said at a Netflix slate event for the region on Thursday, 8 November. What’s helping the evolution is that mainstream movie stars like Saif Ali Khan and Nawazuddin Siddiqui—both acted in Sacred Games—are making the transition to long-form television, Sarandos added. Simran Sethi, director, international originals, India, along with other creative executives pointed out at a panel discussion that when it comes to originals, Netflix is looking for genres and stories that would not find space on the traditional film or television medium. Netflix, which currently serves a subscriber base of 137 million in 27 different languages around the world, entered the Asian market in early 2016, and Sarandos admitted that the initial library was dependent on licensed content—both Hollywood and local. Today, the company is focusing aggressively on originals. Apart from India, Netflix subscribers will soon have a bunch of new offerings from South-East Asia. These include the company’s first Thai productions—Shimmers and The Stranded. Two Chinese projects are also underway, a female centric romantic-comedy called Triad Princess and jailbreak thriller Nowhere Man. The company is also keen on expanding its animation content from Japan, which comprises genres as diverse as science fiction and comedy. There are five projects lined up: Pacific Rim anime series, a spin-off from the Hollywood Afro-Samurai series Yasuke, an animated version of the Netflix original Altered Carbon and dramas Trese and Cagaster of an Insect Cage. There are also planned new Korean offerings. Apart from web shows, Netflix has a spate of original feature films lined up for release, both American and South Asian. There’s romantic comedies The Last Summer and Always Be My Maybe, Tiger Trail shot in Taiwan and the latest take on Mowgli (from The Jungle Book).